It's been so long since I've written on this blog that I'm not sure I remember how to do it. :) However, I will not let that deter me...it's time to catch up! It would be difficult to sum this summer up, even if I gave myself pages and pages to write about it all (don't worry, I won't do that). This has been one of the most growing seasons of my life, and it has been a particularly stretching season for our little family. That does not mean it was bad...if fact, this was truly a great summer! I'll try to hit the highlights through pictures here, and hopefully I'll cover most of the major events of this past summer. We gave Henry a puppy for his 8th birthday. Our neighbor's (the Williams) were bringing home her sister, and they thought we might like one too. It turned out to be just what we were wanting to do for Henry's birthday. He was so excited. Henry named his puppy Maggie. He took her for walks, played with her at the park, worked on training her, and basically took over her entire care. Henry has a natural gifting with animals (so we knew he would take good care of her), but we were amazed with how well he did. He never needed to be reminded to look after Maggie, he was very attentive, and he spent a lot of time training her. Maggie was a good puppy, but unfortunately she was not trained in staying away from the car. Tragically, she was run over as I was backing the van out of the driveway one morning on the way to the park. She did not survive. None of us were prepared to say goodbye to Maggie quite so soon. Henry dealt with the death in a mature way and we are so very proud of him! After the mutton bustin' we were able to sit and watch the rest of the rodeo. Being that this is a small town, we knew at least half of the people in the stands. It's fun to live in a nice little place like this. The rodeo includes a 'cash grab' (Henry's favorite part) and lots of other fun events. One of the kid's very favorite things is riding bikes. We ride around the house, up and down our street, take bikes to the park and nature preserve, take them camping, and this year we even took them to Florida! I love that we have bike-loving kids! One day the kids and I came home and found a baby donkey in our pasture. That was a shock! We had gotten the mama (Sky) 11 months prior and were told that she might be pregnant. We watched her closely for the first few months; but as we didn't really notice any changes in her size, behavior or eating habits, we decided she must not be expecting. So I was fairly surprised to come home to mama herding her (not so) little baby around the back pasture. Sky was quite protective at first, but eventually let us near the baby (who we named Smokey-or Gunsmoke, depending on which member of the family you ask). Sam built the kids a couple of tree forts this summer! The first one is up in the middle of a tree right outside my kitchen window. The second (pictured below) is a platform coming off of a tree a few yards away. Last summer Sam built them a play house on the ground. They have SO much fun in those three areas! Henry recently moved our play kitchen out to one of the forts, and they have various other stores set up throughout the fort. They continue to amaze me with the games they create. We often take camp chairs and books out to the platform fort to read in the afternoons...it is just perfect! We had some time to go fishing this summer too. Even though there is a drought in Texas and all the lakes are LOW, we still had fun trying. I'm not sure we actually caught a single fish, but sometimes the fun is just in the fishing. This picture was from a mid-summer adventure at a local park. We earned free tickets to Six Flags (for the kids and for me!) 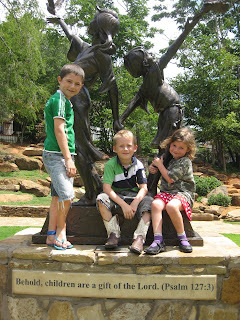 through their Read-to-Succeed program, so in July we spent a family day at the park. It was SO MUCH FUN. We thought it might be too hot, but there is a lot of shade, water misters everywhere and they are more than willing to fill up your water bottles with ice and water at any of the restaurants. Because it was hot, there weren't really lines for most of the rides. We had to wait a little bit on the really big roller coasters, but since we can't all ride those anyway, that wasn't a problem. We usually go to Six Flags once a summer (on homeschool day, since it is a discounted day)...this was our second trip this year....and I think it was the best one yet! While we were there we snapped a family picture at the top of the oil derrick (the only place where you can stand in one spot and view the skylines of both Dallas and Fort Worth!). 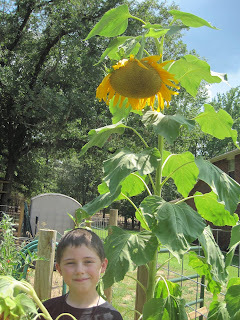 We had another (semi) successful garden...our sunflowers did VERY well, as you can see. Tomatoes were incredible and produced all summer long. The cherry tomatoes started later and ended later and were fantastic. Squash and zucchini were average, beets were a bust, peas burned and peppers never came up. 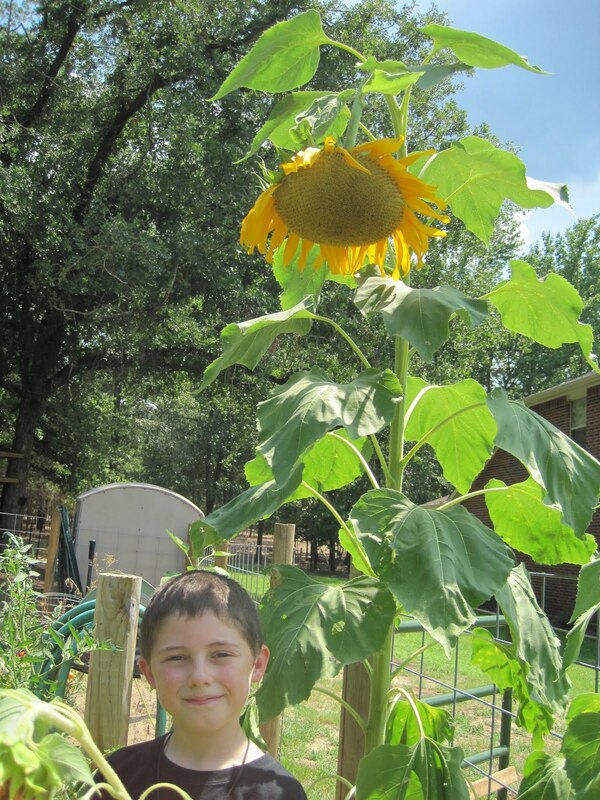 We had a few good-sized watermelons on the vine, but I gave up on the garden before they were ripe. 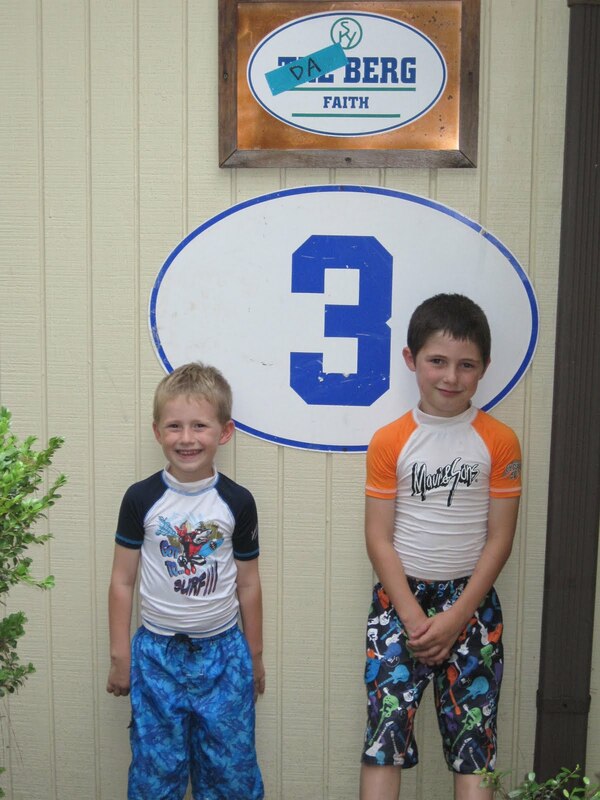 The boys got to go to Grandkids Cowboy Camp again this summer! Dave and Mary Beth are so wonderful to put this on every year. The kids have an incredible time (swimming-mudding, archery, bb guns, crafts, marching, singing, cooking, cleaning, Bible study) and love to spend time with their grandparents and cousins. Much preparation, time and love go into putting this on, and we are so thankful for Grandparents who invest in their grandchildren! This is truly a great experience and creates wonderful memories for the kids. The boys also were able to attend Sky Ranch camp again this year! This was their second year to go to Sky. 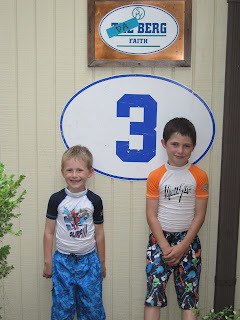 Last year Jonah went to day-camp, so this was their first year to go to overnight camp together. They stayed in Da Berg, the most rockin' fun cabin on camp! Sadly, we got a call from the camp nurse on Wednesday night. Jonah had been running a fever and was confined to the nurses station. 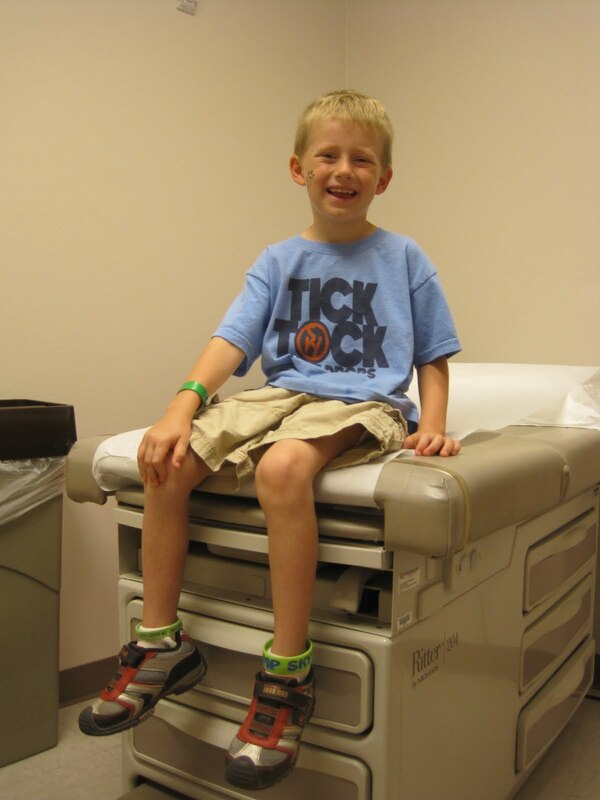 They were pretty certain he had strep throat, but it was late and the doctor's office was closed. After conferring with everyone involved, we let him stay the night up there and picked him up the next morning. I took him to the clinic, and sure enough...he had strep throat. He was able to start an antibiotic right away and come home to rest. Jonah stayed home the rest of the week but during the closing show he reunited with his cabin mates. Jonah was sad to have to leave camp, but he was so thankful for the time he got to spend up there! And his wonderful counselor Ben (pictured on the left) stayed with him in the sick bay. He let Jonah stay up really late, played games with him and kept him company until he fell asleep. Then he dragged a sleeping bag to the floor beside Jonah's bed and stayed there with him all night long. What a dedicated and thoughtful guy! We so appreciate the wonderful counselors that Sky Ranch brings in every summer. They really make the experience incredible! Our biggest event of the summer was getting licensed to provide foster care. We stared going through classes last fall, took a break through the holidays and beyond, and finally received our license the middle of May. Two weeks later we received our first placement, H, a newborn baby who came straight to us from the hospital. H was a super-sweet baby, and our family all loved him immediately. We worked hard to get him on a schedule and remember what it was like to have a newborn in the house. (I will say that it's a lot easier to handle a newborn when you haven't just been pregnant!) We were told to plan on having H for a minimum of a year, so were were absolutely shocked when we got a phone call at three weeks telling us that CPS was on their way to pick him up. Turns out that H had a family member come forward who wanted to care for him. We said tearful goodbyes, and told our foster agency that we needed a bit of a break while we adjusted and dealt with all the emotion that the quick placement had brought to us. A few short weeks later, our agency called again, this time with an emergency placement. They were having to find a home immediately for a 10 month old boy. We had long-standing plans for that evening, and I told our agency that we weren't able to take him if he had to be placed that night. To make a long story short, after many phone calls back and forth and to Sam, we ended up taking him. A was a sweet, happy baby as well. It was a difficult adjustment for us as we had so recently been caring for a newborn, and a 10 month old requires much different treatment and equipment! We fell into a routine with little A and even got to celebrate his first birthday at our house. It was fun to be able to make his day special, yet it was strange at the same time. The emotions of working with foster care are kind of crazy! We had a lot of ups and downs with our time with A. Ultimately we decided that we needed to have A placed with a different foster family. It had become clear to us that if he became adoptable (if his parent's rights were terminated by the court) we were not going to be able to adopt him. It was a very difficult and emotional decision. The kids (Henry in particular) were very attached to A and had a hard time saying goodbye. He is with a wonderful family who hope to be able to become his 'forever family' one day soon. Of course we spent time swimming this summer as well! It was the hottest, driest summer on record in Texas, so swimming was a favorite pastime. We did not swim even once out at Lake Fork this year, however. The lake got so low that we weren't comfortable swimming off the dock. We did spend time at TM, Sky Ranch, our neighbor's pool and various friend's pools. It was a crazy busy summer, and it seems as though it passed in the blink of an eye. We grew together as a family, and we have bonded in a way that I am so very thankful for. The Lord treated us graciously and gently, and reminded us to be thankful for everything that He has provided us.